This entry was posted on December 26, 2011 at 12:48 pm	and is filed under Reviews. You can follow any responses to this entry through the RSS 2.0 feed. You can leave a response, or trackback from your own site. While you are far more forgiving of this episode than I, I will admit to getting a tear or two especially at the end. Alas, this will take second place to Partners in Crime as the silliest episode, but it was still enjoyable to watch, and it’s always good to see the Doctor on his own. (I originally posted the gist of this reply to the Admiral on Facebook)…Emma, I normally agree with you quite a lot. I thought the CG overall was quite good. But to be honest with you, through most of this episode I had a sense that this was as close to RTD that Moffat has ever been (it felt like a rough draft, not a polished script), and while some parts were charming, like when the Doctor was showing the kids their room (“I know!”), I thought the show was moving along at a very clunky pace, as opposed to last year’s Xmas episode. I didn’t get the sense that the mom nor the kids had the requisite charisma to pull you into the show, what with their being one-off characters. Perhaps that heightened my response to seeing Amy and Rory at the end, which was a mixture of excitement/relief. . But yeah, the Doctor shedding a tear, powerful! It validated how strong a connection he has to these characters, and it makes me wonder how Amy and Rory will leave the show next season. I think a part of my response is based on how much I’ve bought into the “big story” arc, and stand-alone episodes now leave me somewhat wanting. And a part of me hates writing this reply, because DW podcasters (not you!) who do nothing but complain (see “The Doctor Who Podcast”) irritate the hell out of me! BTW, I really like “Partners in Crime”! How can you not like the Doctor and Donna getting back together?!?!! That aspect of the episode far overshadows, IMO, those cute Adipose creatures. I’m glad you liked it Emma. I was beginning to think I was the only person alive that enjoyed it. Fatal Interview, I know exactly what you mean about the DWP, but I would like to defend the host Tom, he does still have an enjoyment and enthusiasm for DW the others seem to lack. Hi there, Mekster. It’s Mary, isn’t it? Tony here, the Pollyanna Cowgirl Records Podcast guy. Concerning the recent Dr Who christmas episode, I have since “calmed down” and even privately emailed Emma apologizing for not liking the show as much as I should. I think what really is my issue is I am wholeheartedly into the big story arc of River Song and the 11th Doctor’s fate. So, stand-alone episodes tend to bore me a little bit more than they should. 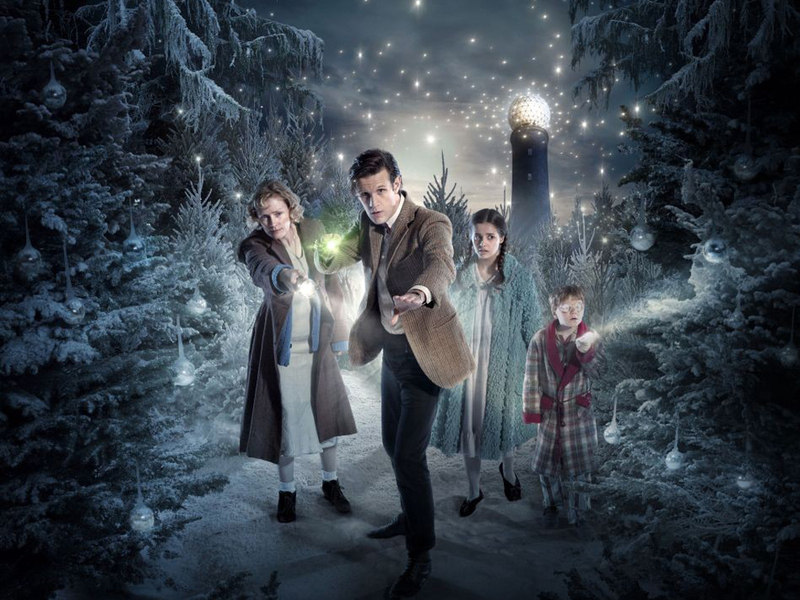 Thus, on first watching this Xmas show, the bit with Amy and Rory was my favorite part. Of course, I loved the funny bits with the Doctor (“I know!”). On second watching, I was able to watch it with my friend’s ten-year old son, whom I’ve turned into a big DW fan (! ), and the magic that should be in the air when watching DW suddenly was there, and I really loved it. As for the Doctor Who Podcast, and I can say this honestly without trying to agree with you just to be nice, I agree that Tom is my favorite co-host. He seems to be the most “fair” of the 3 (now 4, I think), and I love his sense of humor based on his guest appearances on The OodCast. Plus, he’s a musician and has a really cool accent! I understand where these “old” guys are coming from (hey, I’m 44 myself! ), but I do feel they unnecessarily dismiss the “New Who” too much. And frankly, the Big Finish products are verrrry expensive, so I wish they wouldn’t focus so much on that.